Ron Dennis has announced that he will be continuing as team principal at McLaren this year, according to PitPass. Pardon me for saying it but I told you the man would stay and fight. All the flak he's taken over the last months must have hurt but also increased his resolve to see the matter through. That will be good news for people like Flavio Briatore and Bernie Ecclestone, since they will not be deprived of their favorite whipping boy after all. The Flav, in particular, really needs Big Ron to stick around a while longer so that he can insult him regularly and so reassure his golden boy, Alonso, that Renault is the best place to be. In his latest statement, Flavio runs over the same old ground, coloring everything to fit with the view from Briatore-world; it would be quite amusing, were it not so pathetically obvious that the man will do anything to hang on to his favorite charge. World champions need to be protected, he says, leaving me to wonder how Kimi or Keke or Ayrton would have reacted to the mollycoddling Flavio insists is necessary. And then he proceeds to the usual assertion that Hamilton had been McLaren's (for which, read Ron's) darling for the ten years prior to his debut in the F1 team. Strange that the Hamiltons wasted no time in going to Frank Williams when Ron was not being receptive to their demands. Such evidence of a less than perfect relationship does not enter Briatore-world, obviously. When the Flav continues with Fernando's major complaint last season - that the team did not rejoice at his victories with the same enthusiasm as they did for Hamilton's - he merely reminds us of how fragile and petulant the Spaniard proved. The plain fact is that Alonso could not cope with his inability to beat Hamilton on the track and would use anything to excuse his failure. Flavio seems to think that all this will continue to put the squeeze on Ron and his team - but that's a slim hope indeed. I have no doubt that McLaren are relieved to be free of the embarrassment that Alonso became and are looking forward to a great year with two exceptionally talented drivers. If Flavio reckons he can handle the temperamental Alonso so much better, fine, let him get on with it. Rehashing all the same old stuff will get Renault no nearer their next championship - they will have to beat McLaren on the track to achieve that. As for Bernie's offering in the McLaren-bashing stakes, it is fairly typical of his publicity-angling statements. I do find his assertion that McLaren may have offered Alonso number one status rather more offensive than usual, however. Not even Alonso ever claimed that. It all becomes a bit dreary in the end, leaving me with a sour taste of 2007 in my mouth as I drag myself through the last few days before the Australian GP. Perhaps the new season will bring a halt to all the petty mud-slinging and we can wash out the dregs of a particularly acrimonious year with the hopes and dreams of a new one. Great news about Ron staying. I assume now that bernie and Flav have had their say we can sit and wait for deMontezemolo's next pronouncement on the subject. It won't take long. I noticed Piquet junior had a dig at Ron in the media recently. Clearly he is not very bright. Given that for the foreseeable future Ferrari and McLaren are going to be the two best teams it doesn't make a lot of sense to insult the guy who runs one of them. Flavio's rantings have two purposes that I can see. One is the obvious one of playing to Alonso's ego in the hope of keeping him. The other is to distract from the fact that Renault's car is not competitive. Yes, I thought Piquet's dig at Ron was short-sighted, to say the least. But at least he can rely on Ron not bearing too much of a grudge over it - if Nelsinho turns out to be one of the three best drivers in F1, I'm sure Ron would ignore such ill-judged nonsense. He seems more able to forgive and forget than the likes of Montezemolo and Briatore. Maybe it's my eternal optimism but I really didn't think this would ever happen. The headlines have been knocking about the main stream press for a week or so, but most serious bloggers/commentators haven't really joined in with all the pointless speculation. So I thought it was a great big non-story when we found out he was staying cos he was never EVER going anywhere was he. Really? Well, I thought so too, DBT, but, when one newspaper after another repeat the story and websites begin to chime in, it does shake your faith a bit. I'm just very glad that he's not gone out on such a defeatist note and may well be still in charge when the whole Stepney thing has been truly put to bed. The only time I was really in doubt was the Times article of last Sunday. My impression was that the rumor was printed in the Times then surely there must be some validity to it. I am glad that Ron is staying. For me, at least, he is McLaren. There has been no other principal at McLaren since I became a dedicated fan. Now this spygate should be put to rest. The personality difference are part of the feel of F1. 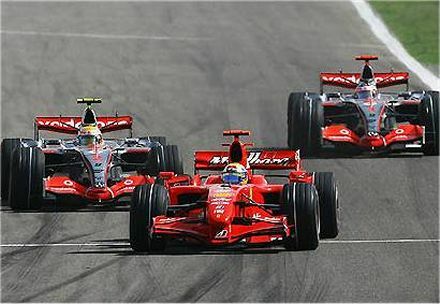 I often wonder why the attemped blackmail by Alonso was never made such an issue. In the end it demonstrated that Ron is above such things. I am not so sure that Briatore would have fired Alonso if he was the object of the blackmail. Flav may have given in to Alonso had he been the pricipal at McLaren. Thank God he is not. I do believe that Briatore and Alonso deseve each other. Watch this impending meltdown as Alonso can not score points in the Renault this year. My real wish this year is that Nelshino is faster then Fernando. Then we can all stand back and watch the fireworks from the Renault paddock!! Last year would have been a near perfect season if it hadn't been for th infighting and backstabbing. I blame Alonso more than Stepney, really. Intent goes a long way in justifying one's actions. Whether or not he handed over the whole dossier, Stepney was quite unhappy at Ferrari and was trying to generate new employment opportunities. Alonso, on the other hand, was acting like a crybaby and resorted to blackmail. He could not have left if Ron hadn't shoved him down the stairs, so it's a bit rich for Briatore to be crowing from his high horse. And Bernie's after-the-fact pronouncements simply show his myopia. He's usually wrong in his predictions, and equally wrong in his assessments. I think that Bernie and Flabio need to go on a nice cruise together, peel each other grapes while patting each other on the back. Meanwhile, let Ron and the rest race. That's what they are in it for. And I don't think Piquet is dim, he's just immature. Perfect team-mate to Alonso, makes him look polished. Seems we are unanimous in being pleased that Ron is staying put. It just didn't make sense that he would leave right before the start of the season. But I don't worry too much about what Flavio says. His mouth has always gone into gear before his brain. Lets just hope that Fernando has grown up a bit since last season and learnt a few lessons from what went on last year. But with Flav mollycoddling him that may not happen. "Perfect team-mate to Alonso, makes him look polished. " The cast of characters for this season are simply colorful. This past years antics have allowed us to see true alliances and extreme bitterness among the players of F1. The offseanson was indeed entertaining. This season appears to have a much different feel then the beginning of last season. It is so much more ardent then any start of season that I can remember.